This is one of the oldest questions in job-search. It’s also one of the most common questions professional resume writers get. You’ve been out of the workforce for a period of time. How do you explain this gap in work history on your resume? After all, you can explain away anything once you get to the interview. But your resume has a big gap in dates on it, and you can’t do a footnote explaining why this has happened, can you? Honesty is the best policy because we can all understand this sort of thing. In fact, it’s happened to the majority of us. Who do you know who has worked 40-years solid in their career. You have to trust the hiring manager can understand if you took some time off to recover from a major surgery or nurse an ailing parent. What if you took time off to be a homemaker? Listen. It’s not 1972. Employers in this day and age are familiar with, and comfortable with the idea of parents of either gender taking some time off to raise the kids and then attempting to re-enter the workforce. Don’t do it. You raised your kids. We know what it entailed. Getting too cute can sometimes come off as just that: too cute. Unprofessional. 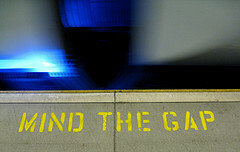 Option B: There Is No Gap. But what if you got laid off? In other words, what if you have a gap in your work-history through no choice of your own? How do you explain the months (years?) for which you have no employer and job title listed? As I’ve written before, hopefully when you get laid off, you immediately get proactive. The job search is your job. Always be plugging away at it. But don’t sit there twiddling your thumbs when you’re not sending out resumes. If you’ve gotten laid off, immediately begin DOING THINGS. Think about it. If you were a professional athlete, and you got cut from the first team, would you sit around and be fallow? Or would you immediately double down in the gym, get in better shape, learn new skills or double down on old ones, all so you could show the coach that you were ready to be called up again at a moment’s notice? Exactly. You want to show employers that you might be on the DL, but you’re still committed to this game, and you’re ready for the call up whenever it happens. Attend conferences related to your career. All of these things can be inserted into your resume as pseudo job titles to help explain the gap, or even close it completely. At the very least, they would tell an employer you never took yourself out of the game, even though you were sidelined for a time. Hopefully everyone reading this who is unemployed has already done this. If not? Get out there. It’s not too late. And if you still can’t creatively explain a gap in your resume, well… I can’t think of a better reason to hire a professional resume service. what do you say when you have a gap in your employment history because you were going to school and the interviewer is not satisified? I’ve been studing in my field to advance myself since I lost my job and I was recently turned down for a job after my interview because there were gaps in my employement history even though I explained I was in school.